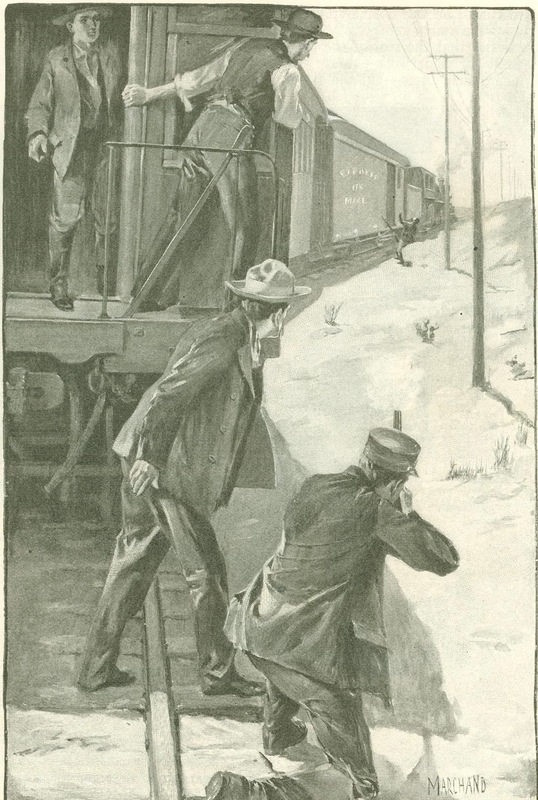 Train robbery has been a recognized branch of criminal industry for nearly forty years, yet the advance in it has been far less than might be ex­pected of a pursuit that has, at one time or another, attracted the shrewdest, as well as the most daring and enterpri­sing of the criminals of America. The gross receipts by train robbery have averaged not far from one hundred and fifty thousand dollars a year, and, as not more than twenty thieves or­dinarily share this booty, it is not diffi­cult to understand why men follow it in spite of its dangers. The large pro­portion of the best exponents of the craft are dead or in penitentiaries, but the train robber is a lord in the king­dom of crime. In all the penitentiaries of the West he rules the common run of lawbreakers. The flashest burglar in stripes, even if he has the red device of murder on his coat of arms, is glad to maneuver to be­come cell mate to the man who is there because he held up a train. For him the caged thieves and thugs fetch and carry and offer their tribute of tobacco and contraband comforts and to him is offered the captaincy of projected jail breaks. But the industry is appallingly conservative. In forty years there has been only one conspicuous advance. It has not kept pace with the progress of related arts. For this reason, it has become the most hazardous of crimes—not in the commission, that is astonishingly easy; but in the getting away. In a country cobwebbed with telegraph lines and honeycombed with detective agencies, with their disheartening out­posts of stool pigeons and informers, es­cape is yearly getting more difficult. The one advance is the use of dynamite for the forcing of the express cars. What may be obtained from passengers is merely a byproduct, and is ignored by many distinguished bandits as involv­ing more trouble and risk than the prob­able yield justifies. It has come to be the practice merely to fire a perfunctory volley along the train side to warn the passengers to still inside and mind their own business, and then to devote what­ever there is of time to the treasure cars. Except for the dynamite, the first train robbery might have been one that took place a week ago, so far as method is concerned. It happened on the Ohio & Mississippi road at Brownstown, about ninety miles from Cincinnati. Two men appeared on the tender of the locomotive and covered the engineer and fireman with revolvers. They made the engineer stop and uncouple the ex­press car, then haul it five miles down the road. They forced the messenger to open the safe, and they realized twelve thousand dollars by the new method of depredation. This was in 1866. Credit for the robbery was given to a family named Reno, but the express company failed to prove aught against them. It made little difference, how­ever for the Renos were caught rob­bing trains soon after and were lynched by a mob at New Albany, Indiana. This was before the guerrillas left without employment by the end of the Civil War took to train robbery and made it pop­ular. The first train robberies caused a panic all through the country. The ad­vent of the railroad in the place of the stage coach had, it was confidently an­nounced, eliminated the road agent from the perils of travel, and here was the old thing in an aggravated form. In the midst of all the excitement, there was another hold up, one which remains unique in the history of train robbery. Two boys of Brownstown were the rob­bers. They carried out the program so well illustrated by the Renos and cap­tured the treasure—three thousand dollars—but their parents learned of their exploit, and delivered them to the police with the treasure. A sound thrashing by the fathers of the two boys was the punishment the authorities thought fitting, and it was administered. One of these boys went to Congress a long time afterwards, and the other be­came mayor of a neighboring city. For a few months the Renos had a monopoly of the train robbing business. There were four brothers of them, Frank, Jesse, Sim, and Jack, and they took in a relative named Anderson as partner. Their greatest exploit was the capture of an Indianapolis, Madison & Jefferson train near Seymour, from which they gleaned one hundred and thirty five thousand dollars. Carrying their great plunder, they got away to Canada, where they were finally caught. With all this money, they were able to put up a strong legal fight, and for a long time it looked as if they would not be extradited. The lynchings took the zest out of train robbery for several years, but when it was resumed it was in a form that doubled the terror the early seizures had caused. It was in 1870 that train wrecking as a means of train robbery came into vogue. Eight men tore up the track of the Chicago, Rock Island & Pacific road near Council Bluffs and waited for the overland. It came, crashed over the break, killed the engineer, and injured a score of passen­gers. As the train went over, the robbers sprang from their hiding places and went to plundering the wounded. They were successful in robbing the passen­gers and in addition got six thousand dollars from the express car. Thirty thousand dollars reward was offered for the capture dead or alive of these rob­bers, but nothing came of it. The enormity of the crime forbade that any of those who took part in it should ever disclose his participation even to other criminals, and nothing was ever learned. This horror stopped train robbing for five years; there were no criminals des­perate enough to work in the face of the storm caused by it. Except for one desperate failure in 1875, when a Van­dalia engineer was shot and killed, the country heard nothing of train robbers until the James and Younger boys be­gan their long course of crime. The glamour of the fugitive guerrilla was theirs, and the Robin Hood reputa­tion they built up stood them in good stead. They were wholesale outlaws, and there is no room in a magazine arti­cle for a circumstantial account of their wonderful career. They realized at least one hundred and fifty thousand dollars from half a dozen train robberies, not counting the considerable sums they took from passengers. The passengers they killed when they failed to part easily. Bob Ford had seen men killed in train wrecking’s, and could not understand why he should not realize a comfortable fortune by the equally simple method of killing his outlaw chief. So he mur­dered him. It was with this same spirit the law officers had to contend in California, when, later, it became the happy hunt­ing ground of train robbers. A long time ago the Southern Pacific Railroad had trouble with squatters on some land to which it obtained title through the courts. The settlers were expelled. If they resisted, they were shot. Since that time, through all of that section the name Mussel Slough is sufficient reply before a jury to the most rousing eloquence and the most convincing evi­dence the railroad can invoke. In this country a small farmer worked a little patch of ground, and hired out as a harvest hand when his own little plot did not require his at­tention. He was a middle aged, red bearded man, with a large family. With them in the cramped farmhouse lived two young men, John and George Sontag, as industrious and common­place as their host, whose name, by the way, was Christopher Evans. The whole outfit was about as inconspicu­ous as any in Visalia, itself a remote town that fell asleep when the railroad left it eight or ten miles off the line in punishment for having failed to give all that was asked in the way of depot sites: In time Visalia got a branch line, but that did not avail to wipe out the past sins of the Southern Pacific Railroad. For a dozen years, train robberies on the line occurred with frequency, and the perpetrators went unpunished. 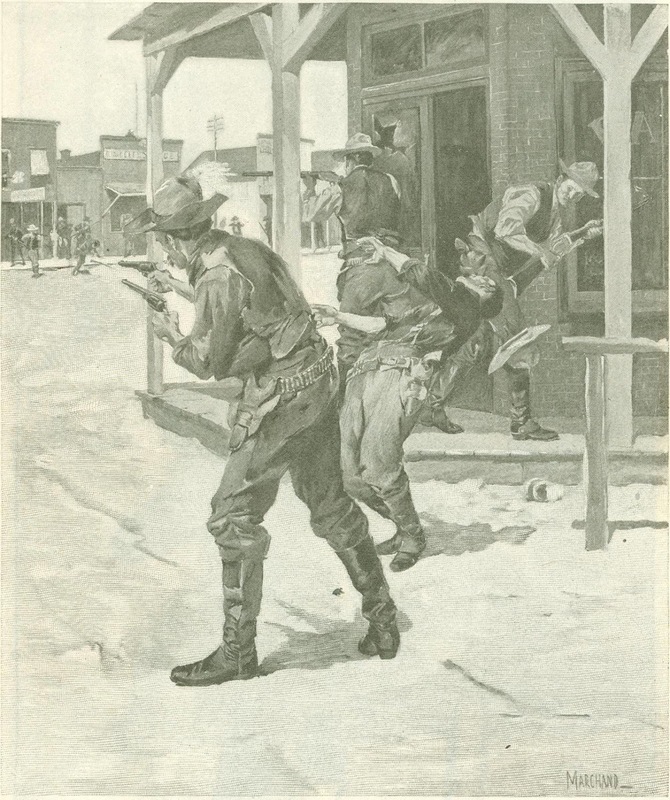 Much of the robbery was credited to the Dalton gang, but the Daltons cleared out for Missouri and Oklahoma and the robberies did not cease. Once or twice an inquisitive passenger who could not keep his had inside the car window while the robbers were blowing open the express car was killed, but as a rule the travelers were not molested. Finally a train was robbed in the usual fashion at the usual place. The mail and express cars were looted, the messenger was half killed by the explosion of a great charge of dynamite against the door of his car, the fireman was forced at the pistol's point to climb through the ragged hole and to open what was left of the door. When it was all over the bandits went off in a cart. It happened that the conductor of the train knew George Sontag, and had not observed him among his passengers un­til after, the hold up. Then the Wells Fargo men came in with the news that they had followed the tracks of the bandits' cart to near the Evans ranch. The identity of the robbers who had done so much to make travel on Cali­fornia railroads exciting was revealed in a flash. A fine trap was immediately laid. A messenger was sent to ask George Sontag to come to the sheriff's office to identify a suspect. He went and was promptly locked up. A strong force then went to the Evans place to get Chris Evans and John Sontag, but the clever thief takers at the sheriff's office had left out of the calculation the feeling of the com­munity. Word of George Sontag's arrest reached the Evans house before the posse did, and while the officers were surrounding the place the door of the Evans barn flew open, two shotguns poured out buckshot, and the posse re­coiled in disorder. When the shattered attacking line reformed it was to find Chris Evans and John Sontag gone, and the best deputy in Southern California lying with his hands full of turf in the Evans dooryard. 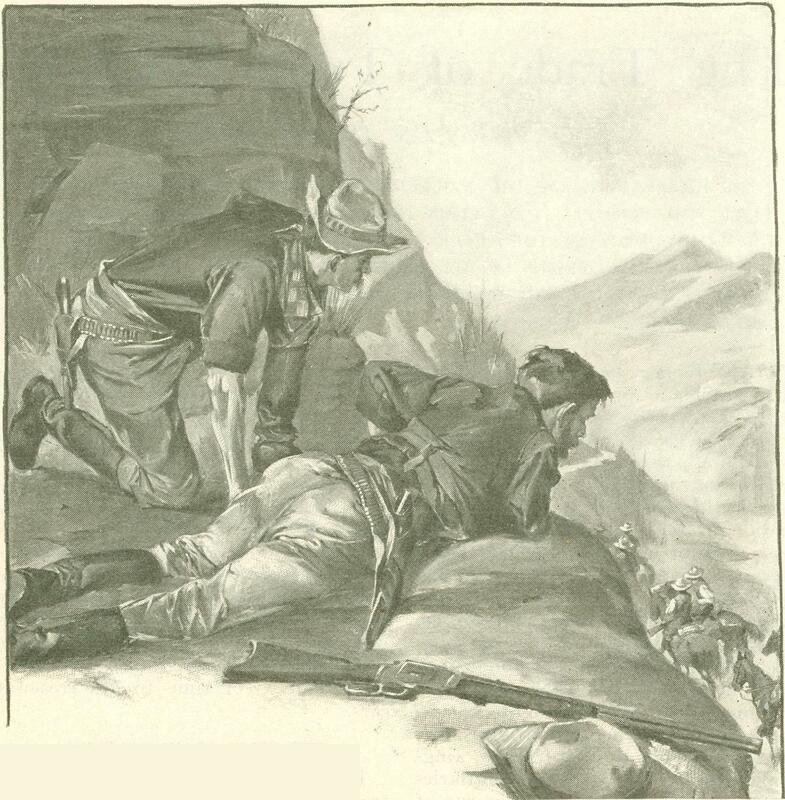 Others of the posse were wounded as well, but neither Evans nor Sontag was hurt. Then began the second stage of the train robbers' life—that of the fugitive. For a year the pair dodged about the mountains, and the rewards for their apprehension steadily mounted until they were worth ten thousand dollars to anybody who would betray them; yet during all that time they were being harbored by men to whom ten thou­sand dollars represented more of wealth than they expected to garner in a life­time. I have stood with a posse in a cabin while a detective was bargaining with its toil worn proprietor to lure the two hunted desperadoes to their undo­ing, when all the time Evans and Son­tag lay under the hay in the barn not a dozen yards from the cabin door. I have listened to a woman—as bad and as hard a woman as ever preyed on a drunken lumberman—promise to send word as soon as the men made their ap­pearance at the mountain den where she and others of her kind laired. I have seen her beg a pittance of the price of her perfidy on account, when all the time she knew the two lay asleep in the very building. I even remember a man, a gaunt old criminal, one who had murdered a Chinese laborer to save the wages he owed him, undertaking to earn the reward by guiding the posse to where the outlaws were hiding, admitting as he did so that but a day or two before they had been his guests in his ranch house. He guided the officers to a camp that had been abandoned by Evans and Sontag. The way was by a trail beneath a big bluff, where the hunted men crouched in safe­ty, eagerly inspecting the personnel of the posse the old rascal had promised to show them. Neither he nor any of the people of the hills would stretch forth a hand to grasp the reward offered them. Occasionally the pursuers came up with the pursued. Once this happened at a cabin where there was no reason to suspect their presence. As the posse came up, a hill roustabout stepped from the hut and without a word walked to the spring for a bucket of water, giving no warning. A moment after, Evans and Sontag jumped out, their guns at the shoulder. When the remnants of the posse came back, Vic Wilson, pro­fessional bad man hunter imported from Arizona, and Andy McGinnis; a man hunter of equal local fame, had been left dead on the door step. The fugitives were away again. It was not that the rest of the posse were unfit for their work—there were good men among them—but the attack had been so swift and the surprise so complete that fear, which comes before courage, got such a start that the nobler quality was unable to overtake it. They never found any wounded after Evans and Sontag had been left in possession of a field. They always put a gun to the ear of a prostrate foe, when there was time, and blew his head off. The next ambush in this long chase was on the other side. The sheriff's men hid for three days in a cabin at the foot of a hill, and on the fourth morn­ing were rewarded by the appearance of their long sought quarry. The outlaws, however, saw the trap in time to drop behind a heap of manure that made an admirable fort. They had the uphill of their foes, and were able to fight an all-day battle. As each of the robbers carried a rifle, a shotgun, and two big revolvers, there was no lack of shooting. The law officers had excellent cover, and the end of a long day found them all, alive, though one had a ball shattered leg, while the two outlaws behind the stack were variously shot up. At dusk, Evans staggered away through a storm of bullets, and the posse let the other alone till the chill of morning should stiffen his wounds. Then they gather­ed him in. He was John Sontag, and ultimately died rather than have his limb amputated. Evans was rounded up at the home of a relative, and, barring the loss of an eye and a hand, was as good a man as ever when the surgeons got through with him, He charmed the waiter who brought him his meals from the out­side, with stories of outlaw life, persuaded him that he was of the brood of bad men, and, with his help and the influence of certain revolvers brought in under the napkin, succeeded in get­ting clear away. Winter's cold and his newly healed wounds were too much, however, even for Evans, and they rounded him up. All the glory the waiter got out of it was the privilege of sharing his penitentiary life with the train robber. With all the murders the law could prove on Chris Evans, it could not hang him, and he is still in the prison at Folsom, a life pris­oner, with George Sontag, who, after an unsuccessful attempt at breaking jail, finally went on the witness stand and testified against his former partner in crime. It was never quite settled whether the Evans-Sontag gang and the Daltons worked together, though in all prob­ability they did. They both worked about Tulare, California, though after a time the Daltons moved away to the Middle West. There they roamed until the band came to an end which was more fitting and more thorough­ly complete than that of any other outlaw gang on record. Bill Dalton, the oldest of the brothers, was perhaps the handiest man with a .44 Winchester that ever pulled trigger. He never raised his rifle to his shoulder, but let go, pistol fashion, from the hip, and so true was the relationship between eye and hand that, in his peaceable hours, they used to bar him from turkey shoots, because at two hundred yards he tumbled the birds as fast as they were released. His record showed that Bill Dalton could shoot men as well as turkeys, which is not altogether a common thing even in Indian Territory, where no close season for either is ob­served. The hold up of a train near Adair, in which all three of the Dalton brothers took part, was enough to give any gang a reputation. Hold ups had been so frequent that the trains were carrying guards, and on this particular train there were twenty armed men charged with protecting passengers and express. But the Daltons swooped down on the train when and where they were least ex­pected, and kept a streak of rifle fire going along the sides of the cars that made it absolutely impossible for a man to show his head and keep that head on. The dead and wounded demonstrated that. The robbers cleaned out the express car as usual. Their adventures and exploits after this make a long story. They killed many people, and stole hundreds of thousands of dollars, but it was all even­ed up at Coffeyville, Kansas. An effort to raid the bank; and incidentally to fight the whole town, reduced the num­ber of Dalton brothers from three to one, and messed this one—the redoubt­able Bill—up so that he was slow on the draw in his next difficulty and joined his brothers on the other side of the great divide. 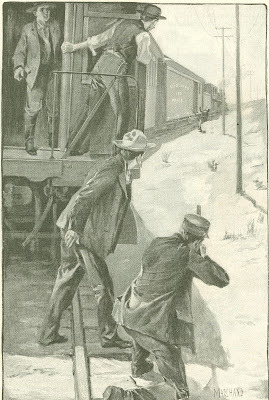 The Coffeyville affair was the greatest cleanup of train robbers the country ever had; nearly everyone who fell before the Winchesters and shot­guns of the citizens had achieved emi­nence in this line. It is only two years since the Black Jack band that terrorized trainmen in the Southwest was rounded up. Black Jack's real name was Tom Ketchum. He operated for four years before they got him. His undoing was the result of avarice. So long as he worked with his gang, Black Jack kept clear of the law, but one day he found it was possible to hold up a train single handed and so to avoid any division of the proceeds. He was trying this on the Texas Express when a conductor jumped off the rear of the train and filled him with buckshot. The gang did not long outlast the chief's mis­adventure.